If you have a site that deals with British Natural History (whether that's 100% or 1%) then please can you send me a link to your site's RSS feed? The more posts it contains the better. At present the reason is a secret - but in the long run you'll get links from a project I'm working on to relevant pages on your site. Mysterious enough? You can leave the feed as a comment or e-mail it to me using the form available from the menu to the right. First of all Bug Girl posted a while ago about an automated louse feeder (picture below). This is certainly a lot more complex than the old fashioned way, used to feed bed bugs in the video below. I have recently been working on a potentially very interesting little project. The Index to the Pittioni Bee Collection may not sound like cutting edge entomology, but there is a lot of information locked up inside the three maroon boxes it resides in. Among this information is some important information on pollinators. One of the problems is that the hundreds of record cards, many of them with 10s of individual records, are at the Natural History Museum, London. They are also hand-written in what is often illegible (at least to me) handwriting. Digitising these records is the obvious solution - but how to go about it? First of all the cards were quickly scanned using a ScanSnap Scanner - a process that I managed in slightly over a morning. Currently I am going through the cards, rotating a few where the ScanSnap orientated them incorrectly and removing any images of cards with no relevant data. This process is being done in a Scratchpad. The site is online, but the content is currently restricted. Once unwanted images have been removed we will make the images available for anybody to view - a relatively minor piece of what Rod Page would probably call silo-breaking. We then plan to develop a method for transcribing the cards within the website. This will allow interested parties to develop the images into a fully searchable databse of the index, increasing its usefulness dramatically in the process. This would essentially be crowd-sourcing in a similiar to Amazon's Mechanical Turk - but with the only payment being a more useful resoruce for everybody. Since starting this Paul Williams at the Natural History Museum (the Bumblebee man) alerted me to some webpages he has placed on the NHM website - there's some very interesting information in here, it's well worth a read. I have also noticed a few articles about bees in the press, one tells the tale of a beekeeper murdering a rival over honey. The rest I will save for another post! Going Digital - by Rod Page from Vince Smith on Vimeo. The MP3 of Rod Page's introductory talk for Talk Science at the British Library can be downloaded from here. In many ways the discussion after this was slightly disappointing, there wasn't a real rallying cry for taxonomy. Slideshow of Rod Page's talk at the Natural History Museum, London. There's a video of the event in the pipeline, but until then check this out. "Ed Baker began a project funded by the Orthopterists’ Society to photograph exemplars of all cockroach taxa in the NHM collection, including all types. This work is being supervised by George Beccaloni and the images will go in to the Blattodea Species File Online (http://blattodea.speciesfile.org/HomePage.aspx)." Perhaps I'm slowly becoming famous! Just for the record dubia is pronounced like dubious, not like double. People do it, and it's wrong! Conrad Gillet does Nature Live at the Natural History Museum, London. Thanks again to Ugly Overload. 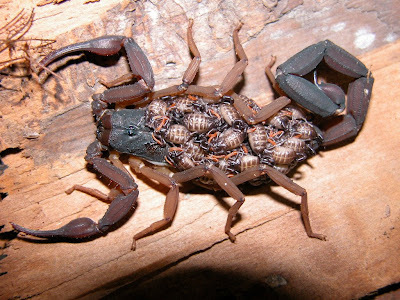 I have never kept scorpions, but will get around to breeding them eventually! This is an incredible clip of a cuttlefish hunting a starfish. Thanks to Ugly Overload for this video. Me at the zoo last year. Just to say that I will be at the Isle of Wight Zoo on Wednesday, 27th May 2009 for their Science Week. Just like last year I will be bringing a range of invertebrates (certainly some of my phasmids and cockroaches - but hopefully quite a few more). I will also be just back from Panama and Costa Rica, so can entertain (or bore) you with stories of invertebrates from my travels. Lamponius portoricensis and Peruphasma schultei - two of the species that I bought along to last year's event. All photographs by Tracy Dove (IoW Zoo Education Officer). Here it is, Issue 36 of Circus of the Spineless! At Unfuture chronicle Scott has some photos of a first-hand encounter with an impressive orb-web spider that feeds on bees. 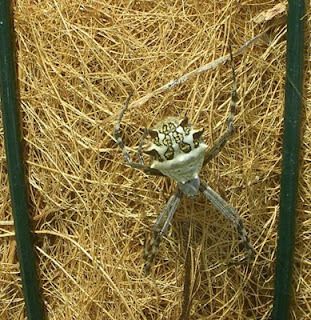 Another orb-web submission came from The annotated budak, with another excellent photograph. Two more arachnid submissions from The annottaed budak: firstly another spider, this time a Ctenid or wandering spider, and secondly a huntsman spider. Nina at Nature remains has some amazing photographs of freshwater crayfish. In the first Darwin-related post, Eric at The Other 95% gives some background to Charles Darwin's work on barnacles and the role they played in his scientific career. Amphidrome has a post on crabs and barnacles of the Texan panhandle, including interesting salt spring fauna. In a second post from Amphidrome the gammaroids of Lake Baikal are discussed, and illustrated. Over at Southern Fried Science there's a report that a soil fungus with a world wide distribution has been recorded for the first time as a a coral pathogen. Ted at Beetles in the Bush covers a recent revision of some of the less well-known buprestid beetles (genera Calodema and Metaxymorpha). These jewel beetles are amongst the most colourful (and best illustrated) that I've come across for a while. Cheshire has a suitably Darwin-related post about Philornis downsi, a fly parasitic on the famous Galapagos finches. Zen at NeuroDojo has an interesting (even more so for me as an orthopteroid specialist) post covering a recent paper on whether male crickets shorten the life of females. Well worth a read! Zen also touches on another one of my favourite issues, nomenclature and language, in this post. Ben has photos of some moths and an ichneumon that turned up in his moth trap. KeesKennis has a photo of a large phasmid from South Africa (Bactrododema sp.). Wanderin' Weeta has sent in a few posts on gastropods. The first documents the return of natural biodiversity following the near-dominance of an invasive species. The second shows us snails eating barnacles, and more! Finaly there is a photo of black turban snails. The Oyster's Garter has some images of what seem to be Blaschka glass models. These truly are marvellous pieces of glass work.